We are here to fill your buckets with some of our weekly INSPO roundtable talk. When we came across the week’s quote, we knew it was the ONE. We are firm believers in the notion that your vibe attracts your tribe. 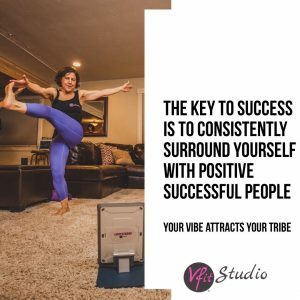 And at VFit, our tribe is one heck of a supportive, positive collection of wonderful women from across the country. Beyond the live streamed classes and trainer team, what really sets our studio apart is just how STRONG the VFit community is. If you read our “member success stories”, nearly every single one talks about the community and team support that VFit gives it’s members. “Successful” doesn’t mean we have met all of our fitness goals, are financially wealthy, or are out winning marathons. Success to us means showing up for YOU, and making self care a priority in your day. It is in the act of self care and self respect, that empowers you to go out and be successful in the rest of life’s important areas – family, friends, health, career, etc. Hopefully by this stage in life you have noticed just HOW important of a role the people around you on a day to day basis play in you life. Surround yourself with a bunch of negative nellie’s and you soon find yourself singing the same gloom and doom scripts. Surround yourself with upbeat, motivated and passionate people and you can’t help but to be inspired yourself to DO more and be the best version of YOU! You are a direct sum of who you surround yourself with, so choose wisely. Our favorite team out there is the VFit team! You’d be hard pressed to find a more DIVERSE group of woman, but no matter the differences and distance between us (literally, we have members from Maine to San Diego), they all support and lift each other up – ALWAYS! // We know that when teammate Kate from Maine logs in, she’s blocked out the time in her day to take 30 minutes to fill her tank. She see’s all of her VFit teammates making the time to show up as well and knows that she too can make that 30 minutes a priority. Having the accountability of trainers she’s connected too and friends she’s bonded with in class, helps motivate her to show up, even on the toughest of days. // We know that teammate Bridget in California has forgone her old Bachelor TV show habit and swapped that for an earlier bedtime, so she can wake up at 515A and get into her regular 530A class FIVE DAYS a week. She couldn’t figure out how to get workouts in with her current routine, so she sat down and took a hard look at how she spending her time. Thanks to the FUN and motivating teammates she gets to meet up with each morning through VFit, her new guilty pleasure is exercise. // We know that when trainer Ceci lights up the screen with her charismatic smile and full swagger dance moves, the whole team smiles a little bigger and leaves class feeling renewed. As a Trainer, she’s sharing a true love of and passion for dance with our members and regardless that we can’t dance as great as Ceci can, her motivation and cheer rubs off onto us all. Because at VFit, we have a built a strong community that supports one another. One that will help give you that bit of accountability that may by lacking in your current household. If you need a boost, in our private member group, you can ask for it and within moments receive sincere words of encouragement from other members and trainers. So if you if you are feeling a bit ALONE, and disconnected – without the SUPPORT YOU NEED to achieve your fitness goals, this quote is here to share and our community may be just what you have been missing. With a team to support you, cheer you on, pick you up, challenge, and change you, VFit will help you make every minute count. Effective, time efficient workouts, all done from wherever you have internet! When you prioritize your health, well being and WHO you surround yourself with – those 24 hours can be lived at such a higher caliber than you knew possible! The payback from taking care of YOU comes in the form of increased energy, self-confidence, more presence in life and SO MUCH MORE! So your mission this week is to do a check in of you surround yourself with on a daily basis. Are they contributing the the better good in your life and this world, or is it time to find a new tribe? Your success is INFINITE in this world and there is room at the top for us all! Success is built by lifting each other up, not by stepping on each other to get to the top!